Jiro criticizing the toughness of a fish that his son purchased from the market. “You must dedicate your life to mastering your skill. Jiro Dreams of Sushi, a film directed by David Gelb about a restaurant in Japan that serves the Michelin-rated best sushi in the world, details the meticulous processes behind the sushi’s exquisite flavor. Reminiscent of the Japanese food film Tampopo, Jiro Dreams of Sushi also describes aspirations for cooking finesse, but highlights the real-life journey of a Japanese man instead of exploring food themes within various fictional scenes. This biopic focuses on the 85-year-old founder and head chef of the restaurant, Jiro, who spends most of his adult life selecting fish at the market, perfecting his cutting techniques, and searching for the best sources of fresh rice. While Jiro’s sushi receives international acclaim, the film contends that Jiro’s inspiration does not stem from a desire for fame. Instead, Jiro finds purpose and contentment within his own lifelong quest for improvement. With obsessive control, Jiro’s Zen-esque pursuit of immaculate presentation and taste in his sushi conflates with his own self-presentation, prioritizing his role as a sushi master as the most important aspect of his identity. 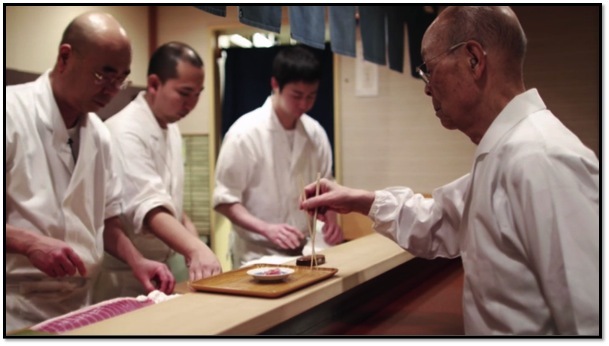 Several specific moments throughout the film highlight Jiro’s actions to control his sushi’s aesthetics and flavor. Every aspect of Jiro’s restaurant follows a formulaic rhythm, monitored by his constant observation. Such regulation seems to mirror Zen Buddhist philosophy, marked by utter concentration and awareness. One day before the restaurant’s daily opening, as Jiro straightens out the napkins set for his customers, he explains: “It’s essential to check every detail. What the staff might not notice, I notice because I have been doing it for so long.” This concern for detail emerges in camera shots of Jiro’s agile hands delicately cradling each rice portion and carefully painting his signature sauce on every sushi piece. Even the restaurant’s spotless interior, containing only ten seats lined up next to the preparation area so that Jiro can place each individual sushi piece on each customer’s square plate, shines with the same crispness of Jiro’s smooth chef’s uniform. The film’s close-ups of Jiro’s perfected sushi varieties highlight the extensive effort applied to different sushi recipes, all presented as singular masterpieces for customers to consume one at a time. The small number of seats allows Jiro to devote his attention to preparing only a few meals, preferring conscious quality to careless quantity. Akin to a Zen priest concerned with discipline in all contexts, Jiro practices similar control outside of his restaurant as well, riding the train to work at the same exact place and time every day and insisting that even his children address him with a formal title. Jiro’s unfailing diligence in every element of his restaurant demonstrates how he equates his sushi-making capabilities with his own self-worth. His dedication to his art stems from a deeply rooted desire to push the boundaries of sushi norms, a desire that blends his very selfhood with his goals for excellence. The film illustrates the history of Jiro’s relationship with sushi, narrating that Jiro returned to civilian life after fighting for the Japanese army in World War II and worked to achieve culinary mastery through years of training. After being abandoned by his father as a child, Jiro longed to validate his existence through success in some capacity after he came home from battle. His chosen fixation, sushi preparation, dominated his life, for he did not spend much time at home while his children were young, instead choosing to log long hours in the kitchen. He describes his career as “doi[ing] the same thing over and over, improving bit by bit. There is always a yearning to achieve more.” Jiro’s son explains that even two heart attacks could not halt this yearning, for Jiro refuses to retire and let his son take over as head chef because he “fell in love with [his] work….” Jiro admits that his work indeed produces his sense of fulfillment, maintaining that while at his restaurant, he feels “ecstatic all day…all I want to do is make better sushi.” According to Gelb’s reverent depiction, Jiro’s mission strictly revolves around reaching increasingly higher standards for the simple sake of reaching perfection instead of attempting to please customers or earn profits. In one instance, when a customer comes in to the restaurant and asks about appetizers, Jiro and his son do not cater to the customer’s needs, instead straightforwardly answering that they prepare sushi and sushi alone. This scene emphasizes Jiro’s motivation to prepare carefully crafted meals rather than to become popular. Again displaying Zen Buddhist principles, Jiro strives for pure simplicity instead of approval. This mindset emerges in other chefs that choose to value their personal ethics more than the uninformed perspectives of their customers, such as the head chef Primo in the film Big Night. Although Jiro Dreams of Sushi shows the technical reasons behind the success of the most famous sushi restaurant of all time, such as the special nori (seaweed) heating process and octopus softening procedures, Jiro’s own personal connection to his sushi’s integrity defines his genius. This success story reveals how food can transform from basic nourishment into elaborate artistry, and demonstrates the levels of devotion required to achieve great progress. Gelb’s idolizing biography paints Jiro as a Zen-inspired hero, armed with meticulous practices learned from a lifetime of an insatiable longing for exactness. Jiro’s manic passion embodies the Zen Rinzai tradition of kensho, or the discovery of one’s true calling, for his health, his relationships, and his own thoughts all fall secondary to his sushi. He acts with an almost heavenly need to materialize this sushi before any other secondary purpose. Gelb’s capturing of Jiro’s unwavering single-mindedness exposes the secret behind his success: the ability to master the Zen concept of pairing his body’s actions with his mind’s ambitions. As Jiro combines his physical movements to handcraft each sushi piece with his own sense of self, he allows the entirety of his being to work towards perfection. “Peony Zen.” ZenWeb. N.p., n.d. Web. Shou Si Zhi Shen. Jiro Dreams of Sushi. By David Gelb, Erland Xiaoye, Zhenyi Xiaoye, Yelong Xiao, and Yihong Shanben. Zhi Xuan, 2012. “What Is Rinzai Zen.” Ningen Zen Japan-Rinzai Zen. N.p., n.d. Web. 26 Feb. 2015.